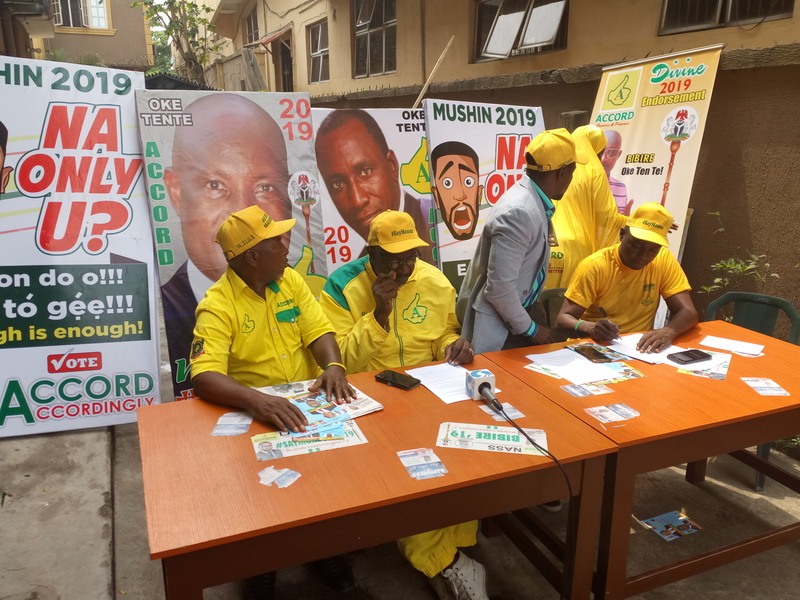 Text of press conference address by candidates of the Accord Party in Mushin Local Government Area of Lagos held on Tuesday 12th , February, 2019 at 11, Owo Street Off Layi Oyekanmi Street, Ilasamaja Mushin. We are glad we called you at this time of intense distress and you obliged us. We know the media as the fourth estate of the realm is the greatest defender of the oppressed. Ladies and Gentlemen, we call you here to intimate you that the teeming members of Accord Party are daily being intimidated by the thugs and other criminal elements of the ruling All Progressives Congress, APC. One of our members was attacked and his head was smashed with an interlock block recently. He was revived back to life in the hospital. The matter is still pending at Area D police station, Mushin. We are constraint to cry out as the desperation of the APC grew as the February 16, National Assembly and Presidential elections approach. In Mushin Federal Constituencies 1 and 2, the choice of the people is the Accord Party. They know they can never win a free and fair contest. Let us place it on record that Accord members will protect themselves against planned violence during and after the general elections within the ambit of the law. We call on the Inspector General of Police, the Lagos State Commissioner of Police and other security agencies to provide adequate security for Mushin Local Government to forestall the breakdown of law and order on the day of election. We urge the security agencies to arrest and put in detention the known career thugs who are sympathetic to the APC in Mushin. We are sure the security operatives know them and their grandmasters and cohorts. They have stockpiled arms and other dangerous objects which they plan to intimidate the voters. They can be caught in their tracts if the concerned security agencies act swiftly. Rigging in Mushin will be costly. The people are resolved to vote out the APC incumbent incompetent representative at the lower chamber of the National Assembly. Their thugs cannot suppress the will of the people. Gentlemen of the press, we also gathered from reliable sources that where violence and intimidation fail, they are planning to induce voters with ill-gotten money and compromise the integrity of the process. We are calling on local and foreign observers especially the European Union team to watch out for the APC voter buyers in Mushin on Saturday. They will fail because the people have seen through deception. Our member in the Mushin Federal Constituency 1, Hon Dauda Kako-Aare has demonstrated that good and impactful governance can be delivered to the people on a sustainable basis. Unlike their one –off tokenism, Kako-Aare institutionalized human capital empowerment especially in the area of education. Free School rides, tutorial classes, micro-credit for traders, financial support for the elderly among others. These and more are the programmes we want to sustain in Mushin 1 and replicate in Mushin 2. The question the incumbent APC rep member is yet to answer is this – How come your counterpart in Mushin 1, who earns same money with you could provide amenities and sustainable supports for his people and you cannot? We are pledging to the people of Mushin 2 that we shall salvage the situation and ensure that the common patrimony of the people is used for the common good of all. We therefore call on all our teeming members in Mushin and supporters not to succumb to their threats of violence. Adequate security will be provided in all the polling stations in Mushin. We top the ballot. We shall carry the day. The yellow big thumb is our logo. Victory is sure. Dino Melaye – True Story Of What Happened Between Me And Remi Tinubu. Must Read. Court Affirms Ondo LG Poll To Hold April 22, 2016.